An edited version of this address was published shortly after delivery in the West Highland Free Press. The full text, as it appears here, was published in The Edinburgh Review, Edinburgh University Press, No. 88, 1992, pp. 158-162 - in a special issue edited by Murdo MacDonald and devoted to the work of Patrick Geddes and contemporary resonances to his theme of "folk, work and place." On 25 October 1991 three of the four founding trustees of the original Isle of Eigg Trust (Bob Harris, Tom Forsyth and myself) held a public meeting on the Isle of Eigg to ascertain whether we really had the mandate that we believed we had in carrying out an advocacy role in the islanders’ struggle with their landlord. This resulted in a secret ballot subsequently organised by the Residents’ Committee. 100% of the island’s permanent residents participated in it and gave a 73% vote in favour of the Trust proceeding. In 1994 islanders had developed a sufficiently strong voice for outside advocacy to be no longer necessary. Accordingly, we stood down as trustees and the residents elected 8 trustees of their own choice. (I was asked to stand, and was duly elected, thereby giving continuity with the previous work of the trust.) 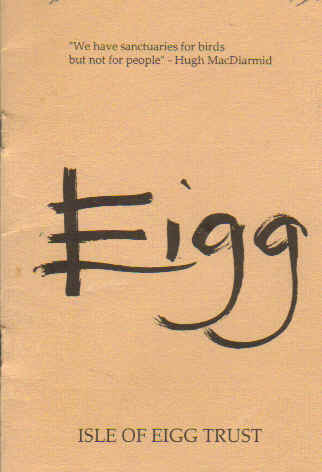 In 1997, the year in which Eigg finally came into community ownership, the functions of the original Isle of Eigg Trust were subsumed by the new Isle of Eigg Heritage Trust, which was set up as a company limited by guarantee and designed to include representation of Highland Council and the Scottish Wildlife Trust, as well as island residents. As of 2000 the original trust still exists on paper, but only at present to fulfil the residual function of handling remaining deeds of covenant etc. (most of the donations were collected through the original trust, as the new one was not up and running in time to do this). The management of the island is not, however, part of the original trust’s work, this being the responsibility of the Isle of Eigg Heritage Trust, details of which may be found on its website. This text is based on the address delivered in the company of other trustees by Alastair McIntosh of the Isle of Eigg Trust. Some two-thirds of the people of Eigg attended the three-hour long public meeting on Friday 25th October 1991. Afterwards the community agreed to discuss the concept amongst themselves and respond in due course. The discussion which followed the address was encouraging. One fisherman, who lives on the island in a caravan because he does not have land, came up the next morning and gave £100. He said he really hoped for his sake and others like him that the Trust's objectives might be fulfilled. A similar donation has been received from the Rev. John Harvey, Leader of the Iona Community. Most of the Trust's expenses to date have been paid for by the trustees, particularly by Tom Forsyth taking on dry stane dyking work. Contributions are much needed and should be sent to Elisabeth Lyon at ... [no longer applicable - thank you]. openly in view of future ownership uncertainty. an alternative model for land ownership on Eigg. item, or investment opportunity, or rich man's playground. while young men, women and children live in caravans. in legal fees to procure freehold over their small plots. rise to the spectre of poverty across generations. featured in "Dances With Wolves". What about Clearance? of life does not require a profligate standard of living. effects of oppression re-perpetuating itself. sold in perpetuity, for the land belongs to me...."
wealthy benevolent laird would be in your best interests. question I put to him now is: ill you give us the land?. lies a font of true viability. settlers - gradually and in limited numbers. Schellenberg, are not without sympathy for this cause. When the original Isle of Eigg Trust was launched on 23 July 1991, 500 copies of a manifesto were printed and circulated to island residents, the press and wellwishers. The text had been drafted mainly by Elisabeth Lyon (who financed its printing), Robert Harris and Tom Forsyth, with Alastair McIntosh being involved initially as an adviser but then as a trustee. The island of Eigg is seven miles off the west coast of Scotland, 12 miles south of Mallaig. It is part of a group of islands with Rhum, Muck and Canna called the Small Isles which, sandwiched between Skye and Mull, form the Inner Hebrides. The island’s 7,500 acres are arranged over three miles east-west and five miles north-south. The island’s topography is spectacular and varied with a richness of flora and fauna which has created what the Scottish Wildlife Trust has called a naturalist’s paradise. It enjoys an equable climate. Over much of its 7,500 acres there is good deep relatively alkaline soil resulting from the weathering of basaltic rock. Though arable cropping is now almost non-existent, good crops of corn and roots have been harvested in the past. With appropriate shelter from the wind, a large variety of fruit and vegetables could be grown. Some high quality sheep and cattle continue to be raised. Bracken is much in evidence and is adversely affecting much of the better grazing land. That smells sharp and sweet - and breaks the heart! “The history of Eigg is, in part, a history of the whole of Scotland. It may not have stood in the mainstream of events but it has caught all the backwash and contributed not a little of its own. Prehistoric man settled Eigg as did the early Christians and Vikings. It provided a base from which the Lords of the Isle rose to power and later came under the aegis of the Clanranald chiefs and was caught up in their piratical clan wars. Men from Eigg supported the Jacobite cause. When it was suppressed, the Clanranalds - their power gone and fortune spent - sold Eigg. During the 19th century, it was owned by a series of extraordinary industrial barons who lavished their money on the island. Today, modem life and taxation have produced a new approach to island-owning and living.” Judy Urquhart writing in Eigg, Canongate, published 1987. In 1828 the Clanranalds sold Eigg to Dr. Hugh Macpherson for £15,000. In 1893 the Macpherson family sold the island to Lawrence Thompson. In 1917 it was sold to Sir William Petersen, a Dane. In 1925 Sir Walter Runciman bought it from Petersen’s executors for £15,000. At his death it passed to his son, Sir Steven. In 1966 Sir Steven Runciman sold it to Captain Robert Evans, a Shropshire landowner for £82,000. In 1971 he sold itto Bernard Farnhum-Smith for £120,000. In 1975 Keith Schellenberg bought it for £250,000. In 1989, after a protracted legal suit with his former wife, he was ordered by the Court of Session to sell it. The estate consists of 6,000 acres, the Lodge. an Italianate country house built by Sir Walter Runciman, the estate farm and various other buildings. Most of the islanders live at the north end of the island and where they farm 1,500 acres exempt from the freehold of the estate. The present focus of The Eigg Trust is to purchase the property, either outright or to participate in a joint purchase with another trust with compatible aims. Exploratory talks to this end have already taken place. To pay for this, the Trust will seek gifts of money from individuals or foundations or any other agencies sharing its aims and willing to support it financially. “We are an obscure poor people though formerly of better account, removed to a remote corner of the world, without name, and without alliances.” - Lord Belhaven, speaking against the Treaty of Union in Parliament House, 1706. The clan system - clann means family in Gaelic - while giving the clan chieftain dominion over his people also charged him with the responsibility of looking after them. The Act of Union of 1707 and the subsequent crushing of the rebellion to it of 1745 resulted in the demise of this complex thousand-year old social structure without putting anything in its place. The clan chiefs became the landowners with the lower ranks having no rights whatsoever. This resulted, of course, in the Clearances of the 19th century and the Crofting Act was an attempt to give small farmers security of tenure. In the 19th century, imperialist success funded individuals with colonising aspirations who often took on the responsibilities abandoned by the clan chiefs, with varying consequences for the condition and culture of the indigenous people. But the 20th century has seen the gradual extinction of the kind of wealthy individual who is prepared to use his power without hope of financial gain on his investment. So it would seem obvious that there is an urgent need for a kind of land-ownership which did not set up a conflict of interest and instead served a community of interest. The Trust seeks to aid the development of the whole fabric of island life so that it may become one community. The security of tenure which at the moment only the crofters have would be extended to all inhabitants who took leases of property. The Estate Farm would be run on a profit-sharing basis. A Housing Association would be considered a natural development. The present population would be given due consideration in any planning development with representatives given the opportunity to influence all decisions affecting their lives. It is estimated that the population of Eigg could rise to 200. An increase of this size would greatly add to the scope of the internal trading of labour and/or goods. While it is realised that visitors form a valuable source of income for the islanders, the Trust would encourage visitors to participate in the renewal of the island’s life. At present, the island is served by one year-round ferry service, four days a week from Mallaig, operated by Caledonian MacBrayne, and a seasonal service from Arisaig on the MV Shearsvater run by Arisaig Marine. EEC grants are available for the improvement of the harbour and pier. Under the present system, passengers and goods have to be transferred from the CalMac ferry to a launch to be brought ashore which presents difficulties and dangers even in reasonable weather. To reduce the number of vehicles and items of machinery on the island, the Trust would encourage and organise public transport and haulage systems. It would also encourage the formation of machinery syndicates and cooperatives amongst those working on the land. An engineering workshop would be set up. The Clerk of the Grazings Committee would be invited onto the body to be set up and manage the everyday running of the Trust’s affairs on Eigg. It is proposed that a Community Hall would be a valuable asset, providing greater recreational facilities, especially in winter, meals for old people, laundry and possibly a creche. It is thought grants would be available from various local authorities and the Trust itself would consider funding such a project (which would also be of benefit to all residents and visitors to the island). Help would be given to improve housing for those old people who do not qualify for local authority grants. Tree planting for amenity, shelter and firewood would be encouraged. N.B. When a crofter plants a tree, whether on his croft or on common grazing, at the moment that tree is technically owned by the landlord. It is hoped that the Crofters Forestry Bill at present in progress through the House of Commons will change this. As well as providing courses in the arts and crafts, the Life Centre would explore and experiment with alternative power sources, permaculture* and other appropriate technologies for use on the island. Estate properties could be retained for staff and families of those involved in the Centre. The Estate Farm and Forestry would be run on a profit-sharing basis with opportunities for part-time work. A director would be appointed to co-ordinate the various aspects of the Trust’s involvement. *Permaculture is a term derived from “permanent agriculture” by Bill Mollison and David Holmgren which describes what is green and good with minimum input of energy and minimum output in terms of waste. An approach has been made to the John Muir Trust which met with a helpful and positive response. Two areas of the island would be kept wild: The Sgurr and Ben Buidhe and the eastern coastline. There are already three wildlife reserves under the care of the SWT. There are seven SSSIs. The intention of the Trust would be to respect these areas and to further conservation with such activities as native woodland plantings. The area to the south of the Sgurr, where an ancient cross was found, could be designated a retreat area. There is a possibility of rebuilding the black houses in the area - as such. A primary school exists. With more children, development is proposed along the lines of Scoraig in Wester Ross, Hartland in Devon. This would be a very important part of the Trust’s activities. A survey would be made of existing properties and surrounds with the intention of creating a number of new holdings giving scope for gardens, in-bye and possible tree plantings. These holdings would give their owners security of tenure with individual responsibility for improvement of properties. A valuation would be made of each property and the incomer due to pay an agreed value though payment could be spread over years and labour could be used in lieu. A rent equivalent to that of a similar croft would be paid. Any change of tenancy would need approval by the Trust. Appropriate new housing would be sanctioned where necessary if and when further holdings were needed. “Thousand acre farms are commonplace nowadays and land holdings are getting bigger and bigger. Yet time and again studies have shown in England and America, that the bigger the holding. the smaller the production of food per acre. We should put pressure on successive governments to make land available to people who are prepared to train themselves to use it, and prepared to live on it, and grow food on it seriously. And then we should put pressure on these governments to alter the planning laws in order to give every citizen the right to build his own home on his own land: the right of the robin or the wren.” - John Seymour, Getting it Together, Michael Joseph 1980. The Crofters Holding Act of 1886 which was described as “the Magna Carta of the Hebrides” heralded not so much a new era but actually perpetuated small uneconomic holdings and succeeded in insulating crofting from the mainstream of agriculture. Crofting land was both unproductive and unprofitable; the islands desperately needed some new development but were given stagnation. Land held by trust for the common good is not a new idea in Scotland. Constituted by Deed of Trust in 1924 by Viscount Leverhulme the Stornoway Trust manages 64,000 acres of Lewis, including the town of Stornoway, Lewis Castle and well over 1,000 crofts. The Stornoway Trust also encourages settlement. The Secretary of State for Scotland currently proposes that the Crown-owned estates of Skye and Raasay be sold. One option considers their transferance to Community Trust. Para 3 The Secretary of State regards it as anachronistic that he should continue to own and administer as landlord large tracts of land when the purpose for which the land was required has long since been achieved. Para 13 f. Should the approach being proposed by the Secretary of State also be considered by other crofting landlords. 5.1 It is worth recording that currently the DAFS estates are being held in a form of community ownership … in the person of the Secretary of State for Scotland. 5.2 On the positive side, this has meant that the beneficial interest of the landlord has been exercised without fear or favour in respect of any narrow local interest. On the negative side, this has excluded any sense of local responsibility. It is natural that thought should now be given as to how responsibility can be identified more locally. 5.3 The most direct precedent for local community ownership is The Stomoway Trust which was set up in 1924 as a conventional trust, but since 1875 has effectively been a body corporate incorporated by Act of Parliament. The aims of The Stomoway Trust emphasise the Trustees’ management role in respect of the Stomoway Estate. 8.1 A transfer of the ownership of land is now likely to slow down such improvements (to crofting incomes) and may, if the members of the Trust see themselves as trustees of the local community, assist agricultural progress. In addition though it could be expected and could be required to initiate and encourage all forms of development on its estates which were likely to provide jobs, increase income or otherwise the maintenance of the present crofting communities. The Trust’s contribution to development would be primarily through its ability to make land and associated rights available. 8.2 . . . views on non-agricultural development potential: sport, tourism, fish-farming, and associated household trades. “In each of these, development potential is limited at present and no one activity seems likely to provide a substantial increase in job opportunities or incomes. Rural development, however, is by definition diverse and on a small scale. An important point is that virtually all the activities mentioned depend in some way on the access to land or water resources. The active co-operation and support of the owners and occupiers of the land is thus essential; moreover, an income based on a new use of the land may also accrue to the landowner. An obvious example of this is the provision of the new house sites. In practice, the price paid for such sites within a crofting community is often shared between the occupier (the crofter) and the landlord. A community trust which acquired the ownership of the land would have a strong incentive to encourage developments which increased its own income and/or brought obvious benefits to those it represented - the crofters. 8.3 We have no evidence that DAFS ownership has inhibited any developments in the past and, therefore, conclude that too much should not be expected in the way of new developments from the transfer of ownership itself. Nevertheless, our view is that ownership and control by a local community trust would be likely to provide a local means of implementation of new developments. 12. The Secretary of State would welcome views on the principle of transferring ownership of crofting estates to a Trust or Trusts and on the basis of which any such transfer might be made. In seeking views on the issues set out in this consultation paper the Secretary of State recognises that, if there were to be a measure of agreement on the principle and broad basis of transfer, many points of detail would require to be considered and decided before legislation could be enacted and implemented. The threat of climatic change, the squandering of non-renewable resources, a world population rising inexorably, the abuse of land, the destruction of forests, all the present and impending crises, coupled with an increasing dissatisfaction with materialism and the spiritual emptiness of the age have contributed to a growing desire to create a way of life, more meaningful and healthier than that offered by much of the contemporary world. The common conviction of the Trustees is that the island of Eigg represents an eleventh hour opportunity to arrest the decline and disappearance of a civilisation which successfully practiced living in harmony with nature. Celtic culture survived the Romans, most notably in Ireland, but also in the more inaccessible areas of Western Europe. Through Columba’s grafting of the new Christian teachings on to the traditional Celtic stalk, these ancient ideas were disseminated by his followers back through Europe. Against Columba’s advice, perhaps significantly, Donnan went to Eigg, where he and his entire band of devotees were martyred. (Donnan has however given his name to no less than 14 places on the Scottish mainland). The dispute over procedure which brought the Celtic and Roman churches into conflict was resolved at the Synod of Whitby, after which the Celtic church went into decline, although the Episcopal Churches of Scotland and Ireland still cling tenuously to this root. The island of Eigg, 3 miles east-west, 5 miles north-south, supports both Roman Catholicism on the west coast and the later development of the Protestant Church of Scotland on the east coast in peaceful co-existence. The same remoteness from the centres of conflict which fosters this toleration meant also that the music and poetry of the people was not suppressed when elsewhere for religious and political reasons it was banned. When Marjorie Kennedy-Fraser went in search of the lost musical tradition of Scotland her meeting in 1908 with Kenneth MacLeod, a native of Eigg, resulted in the Songs of the Hebrides. So uniquely, in the culture of the people of the island of Eigg, we have not only the modem Gaelic language of every day use, but the ancient sacred language of art. When a shoot is grafted on to an established stalk, the green of the shoot must meet the green of the stalk. The green, or cambium, is the only living and dynamic part of the plant. In the cultivation of human beings the same natural law must apply. The Trust aims to be one small step towards the reapplication of this law of nature in human culture! Although the Trust’s present focus is the island of Eigg, it is hoped that this new concept of land ownership and management could serve as a model where appropriate in other parts of Scotland. Last summer, I spent some time up at the re-populated isolated crofting community of Scoraig near Ullapool and was deeply impressed by the lifestyles being lived there which include home production of energy from windmills, trees surrounding the crofts so that a wide range of fruit and vegetables can be grown, and economic activity ranging from boat building and shellfish farming to violin making, farming, craft work and specialised tourism. One of the 80 or so people living in Scoraig is Tom Forsyth of whose reputation I had already gained a favourable impression since he was one of my distant predecessors employed by George MacLeod in the earlier days of the lona Community. Tom came to me several weeks ago to outline the interest he is co-ordinating in trying to make it possible for the island of Eigg henceforth to be owned and managed in a way which, like Scoraig, would set a standard in human/ecological lifestyle. I have given Tom some support in drawing his ideas together and I know he also has the personal support of my colleague, the Rev. John Harvey, present leader of the Iona Community, amongst others. He has no personal financial resources (living himself as a crofter) but he does have a concept which is supported by many and which, I believe, is the right way to go about restoring our broken Hebridean communities where, the Napier Commission not withstanding, people have often been prevented from forming an integrated relationship with the environment since the Highland Clearances. The Isle of Eigg Trust is a registered charity. Alastair McIntosh is a founding Trustee of the Isle of Eigg Trust with Tom Forsyth, Bob Harris and Elisabeth Lyon.